One way to state the ethos of the Christian story would be to state it in terms of the creation, fall, redemption, and the final judgement of man. The form that the final judgement takes in Christianity is that of the ‘punishment of hell.’ It is argued that love requires justice, and justice requires an accounting for wrongdoing, and payment for wrongs done. 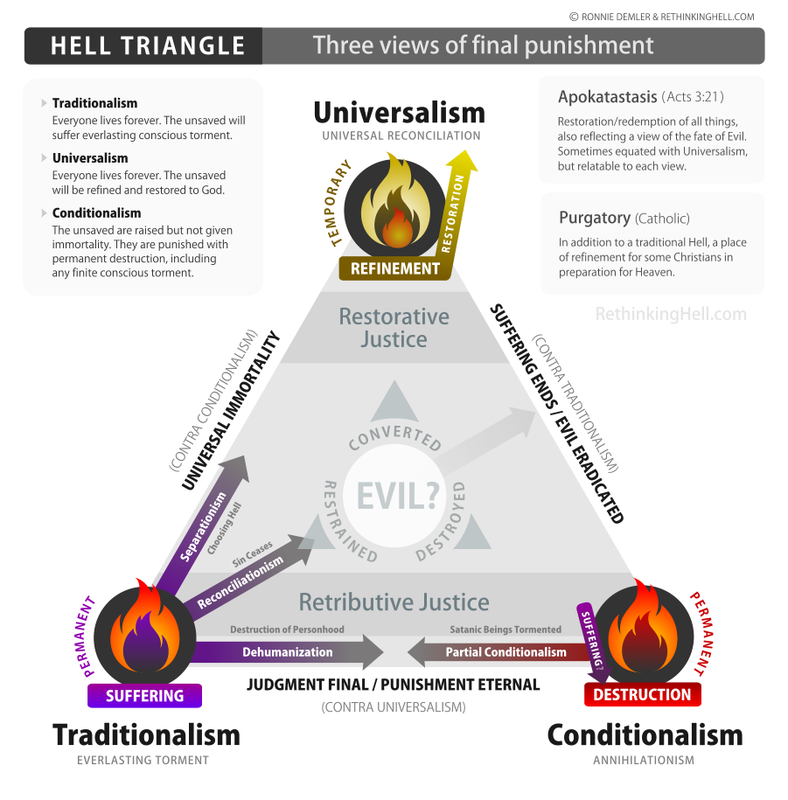 But how does hell function as part of this just punishment, and what is the ‘correct’ biblical view? The Traditional View, a.k.a. Eternal Conscious Punishment (ECP), claims that those who fail to receive Christ are tormented forever in hell for their sins. The Conditional View, a.k.a. 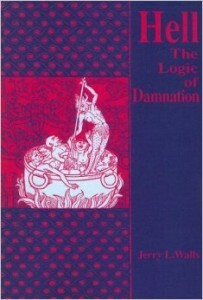 Annihlationism or Conditional Immortality (CI), claims that the resurrected damned, having failed to fulfill the conditions for receiving immortality through Christ, are punished with annihilation, and cease to live, gone for eternity. The Universal View, a.k.a. Universal Reconciliation (UR), claims that even after death, all people will have a chance to hear the gospel, and eventually, all will finally accept the love and redemption in Christ, and thereby be saved from hell. For those who hold a high view of scripture, including its infallibility and authority, the first and most important argument must be made from scripture, not philosophy. However, all three views, at least on the surface, can point to scriptures that seem to directly support them, so all have other passages which seem to contradict them, and careful examination and explication of those ‘problem’ passages needs to be done for each view. That does not mean, however, that all views are equally probable. Personally, I find that the exegetical arguments for Conditionalism overwhelmingly succeed over the other views when standard hermeneutics are applied. In my estimation, Conditionalism has strong explanations for the passages that on the surface seem to contradict it, and it best integrates all relevant passages into an internally consistent biblical picture. And that is why I changed my mind on this subject. For a great overview of the exegetical arguments for Conditionalism, I highly recommend Podcasts 4 and 7 at RethinkingHell.com, where I am a contributor (full disclosure ;). 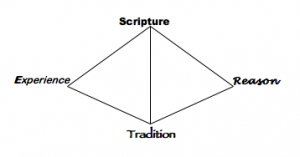 But while the primary argument for any supposed biblical position is exegetical, we can not isolate our theology from the rigors of good epistemology – that is, as the Wesleyan Quadrangle indicates, we must temper our understanding of authoritative scripture with tradition, experience, and reason. Dr. Glenn Peoples has produced a great video covering the tradition behind the Conditionalist view, exploring the many early Church Fathers who were Conditionalists – a point overlooked by many Traditionalists, who assume no such history exists. But beyond intuition, do philosophy and logic lend any support for or against Conditionalism, especially as compared to the majority opinion, Traditionalism? When big ethical implications are involved, an idea must also commend itself from a logical and philosophic point of view. And this is what the rest of this series is for. 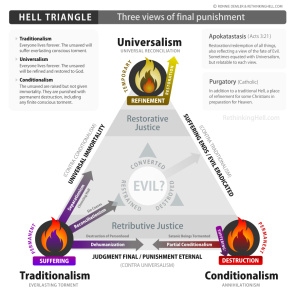 The primary justification of our doctrine of Hell must first come from good exegesis of the scriptures, and Conditionalism has much to commend itself over the other two views, including the Traditional majority view of Eternal Conscious Punishment. But every doctrine must be refined and understood, not in the vacuum of theological musing, but using our faculties of tradition, experience, and reason, the latter of which can be approached formally using philosophy. So let us now answer the question – can a good case be made for Conditionalism from philosophy, both on its own, as well as in comparison to the other two views?